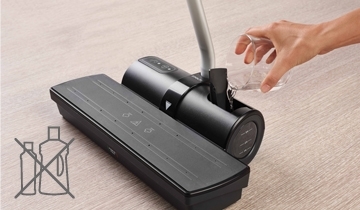 Enjoy the new experience of cleanliness in one pass with Moppy! Moppy consists of a charging base, to steam and sanitize the cloth and a light and agile cordless mop in anodized aluminium that reaches all corners and works around obstacles. The hot steam-charged cloth washes and disinfects all types of floors and vertical surfaces, removing and eliminating 99.9% of germs and bacteria * without the use of detergents. Thanks to the combination of the effectiveness of steam and the simplicity of a light and agile mop eliminating the bucket, annoying and heavy to move, Moppy is immediate, practical and quick, with the added benefit of keeping hands always clean and dry. With Moppy 5 easy steps are enough to sanitize your home: cleaning has never been so quick and easy! Fill the tank with tap water and in just 10 seconds Moppy is ready. 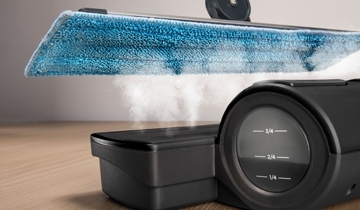 Steam the microfiber cloth on the base and clean: the hot steam-charged cloth retains and removes easily all dirt and bacteria. The cordless mop is agile and ultra-light, reaching the most inaccessible places with maximum comfort. Return to the base and steam the cloth again to eliminate 99.9% of germs and bacteria. * Keep cleaning freely without interruption. Easy and effective! With Moppy enjoy the new experience of cleanliness. Laboratory tests have confirmed Moppy’s double efficacy: it removes 99.9% of germs and bacteria from all surfaces and subsequently eliminates them thanks to the natural force of the steam. 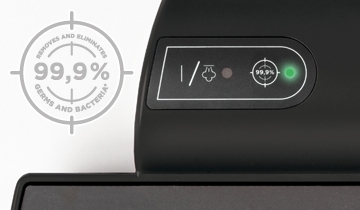 The green indicator light on the charging base clearly indicates the successful destruction of germs and bacteria and the sanitation of the cloth. 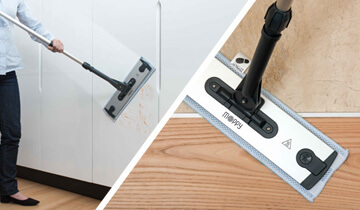 With Moppy you can clean all kind of floors (tile, marble, parquet) and also vertical surfaces such as tiled walls, doors, cupboard doors,etc. In addition, the large size of the mop plate reduces the timing for a complete sanitation of the surface. 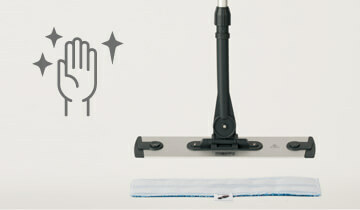 Thanks to its ergonomic grip Moppy is lightweight and compact, easy to move using just one hand. Say goodbye to heavy buckets and water splash. 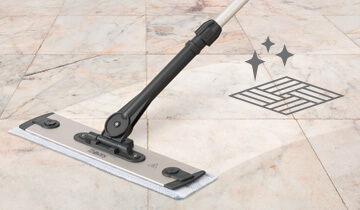 The ultralight cordless mop in anodized aluminium guarantees maximum flexibility: the telescopic handle adjusts to the height of the user, while the 360° articulation and the wide and thin plate make it possible to reach the most hidden corners and clean even vertical surfaces easily. 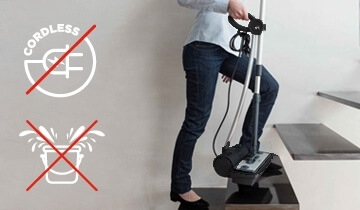 Moppy is safe for the whole family, because the emission of steam is activated only if the mop is correctly aligned on the charging base. During small breaks you can activate the stand-by position: park the mop on the base without aligning the steam activation indicators and fix the telescopic tube to the parking hook. No more annoying streaks or "halos". With Moppy surfaces are quickly and evenly dry, thanks to the combined action of steam with the special microfiber cloths. Moppy cleans with tap water that, turned into steam, sanitizes naturally without chemicals, protecting your health and the environment. Moreover, using Moppy you only need 0,7l of water to clean up to 250 square meters with a significant reduction in consumption compared to the amount of water required by traditional cleaning tools. 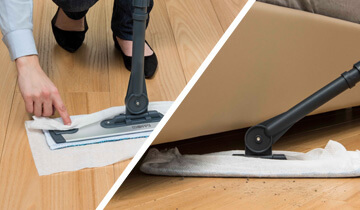 Moppy’s microfiber cloths have a high capacity to collect and retain dirt, germs and bacteria from all kinds of floors and vertical surfaces; indeed they are made from thin flexible and resistant filaments, characterized by a high absorbency and the ability to lift the dirt and trap it until machine washed. Moppy captures also the dust thanks to the electrostatic cloths whose particular structure and thickness trap dust, hair, animal hair or cobwebs.Insert the dust–catching cloth on the corresponding buttons situated on the mop plate, over the microfiber cloth, and start dusting: the ultra-agile mop will reache even the most hidden corners and its large plate will help you clean up in a few wipes. 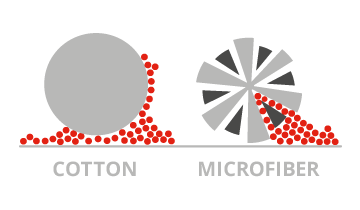 Included 5 microfiber cloths with high absorption power to collect and retain dirt from all types of surface. They are easy to fasten and are machine washable. Included 20 electrostatic disposable cloths XXL size (30x50 cm) useful to capture dust and dirt.